Waiting on Wednesday is a meme hosted by Jill of Breaking the Spine! I recently finished the first book in the series, A Darker Shade of Magic. It was great! I can't wait to read more. Four months have passed since the shadow stone fell into Kell’s possession. Four months since his path crossed with Delilah Bard. Four months since Rhy was wounded and the Dane twins fell, and the stone was cast with Holland’s dying body through the rift, and into Black London. In many ways, things have almost returned to normal, though Rhy is more sober, and Kell is now plagued by his guilt. Restless, and having given up smuggling, Kell is visited by dreams of ominous magical events, waking only to think of Lila, who disappeared from the docks like she always meant to do. As Red London finalizes preparations for the Element Games—an extravagant international competition of magic, meant to entertain and keep healthy the ties between neighboring countries—a certain pirate ship draws closer, carrying old friends back into port. But while Red London is caught up in the pageantry and thrills of the Games, another London is coming back to life, and those who were thought to be forever gone have returned. After all, a shadow that was gone in the night reappears in the morning, and so it seems Black London has risen again—meaning that another London must fall. My roomies are looking forward to this one too! I'll have to check it out. YES! I loved A Darker Shade of Magic and I can't wait for this next installment! I really enjoyed the world Schwab created, but I wish ADSOM had been more complex. I'm excited to read more about the parallel Londons, and see what Lila, Kell, and Rhy are up to. Great choice! I so loved the first book and the anticipation for book two is killing me, it's the one book I am waiting more that little bit more than any other right now! GAH. I really want to start this series. I've heard nothing but good things! Check out what I'm waiting on this week! This is an author I want to pick up. I just haven't got around to it. I know a lot people who loved A darker shade of magic. 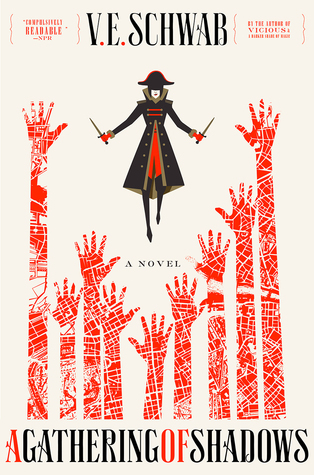 I still haven't read any of V. E. Schwab's books but have obviously heard great things about them and i've been meaning to buy and get around to A Darker Shade of Magic for a while now. The fact the next book is being released seems like a good enough excuse for me :) Thanks for sharing! I was intrigued by the cover so i had to come over and check this out. Sounds like there is plenty of action. I still need to catch up by reading Vicious. Hope you enjoy this!